Shutdown is an exciting command line program available in Vista and Windows 7. I say exciting both in the sense that everyone loves this command, and also exiting in the sense it has a dramatic effect – downs the computer. Therefore, take care when experimenting with this command. Sooner or later you will shoot yourself in the foot, and accidentally shutdown your own machine instead of the computer that you really wish to reboot. So pay close attention to this abort syntax. Shutdown is a built-in executable in Vista, XP and the Windows Server family. Begin by clicking on the Start orb, type cmd in the ‘Search’ box. Your first major decision is do you want a simple shutdown or a restart? To stop the machine, use Shutdown /s. Alternatively, if you want the machine to reboot then type Shutdown /r. After you issue the /s or /r, a dialog box appears with a 30 second count down, remember if you are just testing, then cancel. Watch out for the dialog box disappearing after you type the Shutdown /a instruction. Shutdown /r /m \\MainMachine. The slashes look slightly strange, but that’s how it works, in this example, ‘MainMachine’ is the name of the remote computer. None of these commands are case sensitive so sHUTDOWN /R /m \\MainMachine would work. \\ MainMachine would be a mistake. For example, shutdown /s /m \\127.0.0.1. Useful in batch files. Note: For once the sequence of switches is vital, hence shutdown /m /s \\ laptop does not work. /i is for interactive. This shutdown switch provides a GUI so that you can make your choices more easily. /t is for time. Is 30 seconds too short (or too long) a time? You can adjust with /t: 60 to display the dialog box for one minute. Maximum is 600 seconds. /f is for force. ‘Mr Nasty’, is coming – ready or not! Shutdown /r /f as you may have guessed, restarts the machine, and closes any programs without warning. /c is for a comment. Would you like to put your stamp on the shutdown? Let people know who is in charge, who is shutting them down? 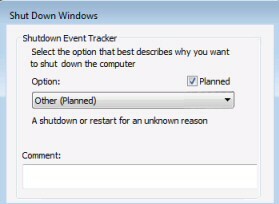 /c "Guy is shutting you down"
How to disable the annoying shutdown tracker. Here are instructions to modify group policy to disable shutdown tracker. PowerShell v 2.0’s Restart-Computer cmdlet is very similar to Vista’s shutdown /r command. A likely scenario is that you wish to automate the reboot of a local or remote server. With a tiny substitution to the cmdlet’s verb you could change the command so that it simply shuts down the computer. See more about using PowerShell’s restart-Computer instead of the Vista shutdown command line. It’s fun to experiment with the shutdown command line switches, one day when you want restart a remote computer, shutdown /r will save you a long walk. My advice is to learn the /a (abort) switch, that way you won’t panic if you issue a command to shutdown the local laptop instead of the network machine.